All amplifiers are of course portable to a lesser or greater degree, but today, we are going to have a look at those specially designed to carry around with you. This could be to practice, possibly use live in the street or park, or keep at home for use or a dozen other applications. Today’s musician sometimes needs more than just a jack socket and a speaker, and we will also look at other extra options some of the amps supply. Yamaha has made an attempt to develop a multi-operational unit with their THR-10C. They have recognized that musicians might need a little more these days than just a small practice amp to carry around with them. Nowadays, many musicians/songwriters write on the move and therefore require somewhere to keep ideas recorded for future use. This little Yamaha is a very good example of a piece of kit that is not just a practice amp but will also give you what you need for writing and even making a basic demo. For playback, it delivers 10w, and you get the sound of five classic amps to choose from, plus other modes for acoustic guitar, bass, and other instruments. There are also settings buttons to allow you to keep your favorite settings and use when needed. The onboard effects are impressive with four reverb and delay effects, as well as, four separate modulations. There is also a 3 band EQ to allow further tonal options and a THR editor that is downloadable, to give even more sound options if needed. These include a noise gate and a compressor, which are available via the THR editor. 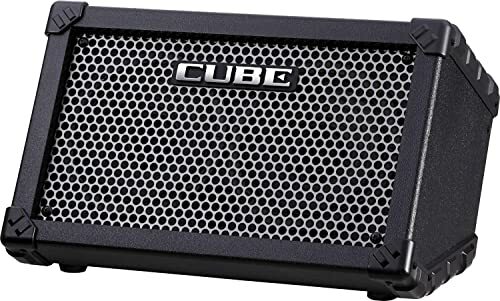 This amp includes Cubase recording software and has two USB ports for recording or playback to your computer. There is a headphone socket with adjustable output control. It runs on an AC adapter or on 8 AA batteries. It is a remarkable practice amp but with so much more, and the quality of the extras supplied is excellent. It certainly fills the need of some musicians who need a little more than just something to practice on. For someone just looking to practice though, it is probably not the right sort of kit. As a practice amp, it gives you many sound options. Will be too much tech for someone just wanting an amp for a bit of practice or a busk on the street. When you think of Roland, you think of Boss if we are talking effects pedals, which is, of course, a division of Roland. But you know the same simplistic quality that is applied to Boss pedals will also be applied to Roland products. 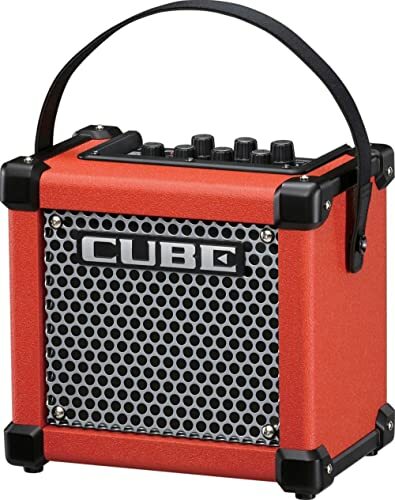 This Roland Cube street guitar amp carries all the attributes of a Roland product. It is a nice, lightweight and compact stereo amp that has a stage monitor, slanted front design. Inside the cabinet are two 6.5 inch speakers. Conveniently built with two input channels for guitar and mic with an XLR, it is designed with live ‘street’ use in mind. And, the power system delivers a punchy sound that defies its 5w rating. The sound options are not limited. Roland is well-known for being able to capture the original sounds of certain instruments and amps, and they have achieved that with this model. Eight different amps are simulated from tube-driven blues amps to metal. Further, it enjoys six digital effects processors and has a tuner built in. The mic channel has a dedicated two-band EQ and delay and reverb. This is an excellent little practice amp. Good at home but exceptional to use on the street. It is tough and rugged and will take usage. It has good effects onboard but doesn’t carry the bells and whistles of some amps. It does, however, do the job it was designed to do and it does it very well. If a good quality practice amp with some excellent effects for a bit of portable live work is what you need this is going to fit the bill. Price wise, it sits about mid-range. Runs on 6 AA batteries or an AC adapter which is supplied. Ideally suited for street work. Will not suit those looking for extra sound options. 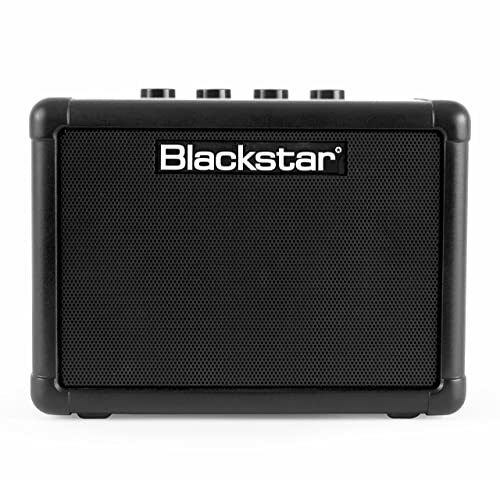 This Blackstar portable amp might be small in size, but it packs a big punch. We shall refer to that statement again later on. Designed we think for travel essentially it comes with a few features that make it stand out. 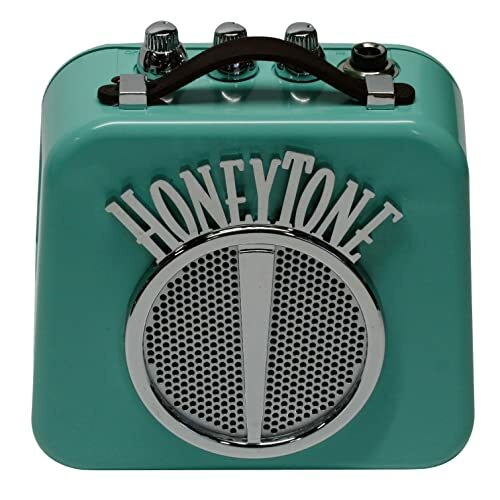 It has two channels that can give either a clean sound or with some overdrive/distortion. Blackstar has included in this model there ISF or Infinite Shape Feature which offers up a whole range of tonal possibilities. It has a tape delay effect which offers further playful options. One might realistically ask the question. Why do you need all those tone options from such a small amp? We refer to our opening statement, it might be small but packs a big punch. And it is a small 3-inch speaker that knocks it out. Don’t be fooled by its size; it is a real amp with real sounds. The sound quality is quite staggering. Of course, it is not going to shatter the windows, but the volume is acceptably loud and the quality produced is very good. One of the big plus points as far as we were concerned with this little amp is that it’s so much fun with so much coming out of something so small, and with all these options. It has an MP3 line in either for playing along to some music or if you prefer, just to listen. And a headphone output is fitted to allow silent practice. And the price? Like the amp itself, it’s tiny in comparison to its competitors. It runs on 6 AA batteries or through an optional power supply. Its small size may put some people off. Another portable amp from Roland’s Cube range, this time even smaller. The Micro Cube. At 12 inches by 12 inches and weighing just 7 pounds, it is quite compact. Small it might be, but its made with a sturdy frame and built to last. It has a five-inch speaker running 3w of output, but it really sounds a lot louder than that. The speaker can handle the volume, and the sound doesn’t start to break up as you near the top of the range. It has a range of effects and tonal options including seven different amp guitar settings including Roland’s famed JC-120 Chorus amp. Included are six special effects – a phaser, chorus, tremolo and flanger with separate delay and reverb — quite an effects package for such a small amp. There is also a tuner, which is always a plus. This really is a great little practice amp that you can take it almost anywhere. Just enough sound varieties to make even practice sound good and enough volume to be effective. It has some nice effects but is not loaded down with them so it is easy to use and practical which is sticking to the Roland philosophy. And, as an added extra Roland has included an interface for iPad, iPhone, and iPod and included the connecting cable. It has a 1/8th output for headphone connection. Not expensive and comes in just below what might be termed as average. It runs on 6x AA alkaline batteries which last for up to 20 hours of use, an amazing amount of time for a battery operated amp, or also with the supplied AC power adapter. A compact amp that is quite powerful. Nice range of effects and sounds. Some may prefer a physically larger amp. Marshall. The name that changed rock music worldwide and how it sounded and how it was performed. And all from a little shop and workshop in Hanwell, West London. For those of us lucky enough to grow up there it was no shock to see Blackmore, Townshend, Page, Beck, all local lads, going in and trying them out. Hendrix came after. An iconic name. But, what have they brought to the practice amp table? It is what is described as a microamp. Just 1w of power, but knowing Marshall, that’s probably enough, pushed out through a 2-inch speaker. Controls are simple, nothing fancy here, one input, volume and tone and finally a switch for overdrive. Wouldn’t be a Marshall without its overdrive kick. It is positively tiny as an amp and comes supplied with a belt clip to allow you to carry it around with you. So, what could you use this little amp for? Well, it’ll be great to use in your bedroom or anywhere at home for a bit of practice. You will get a great sound and an iconic presence. Or, you might be tempted to just keep it on view in the house somewhere and just use it occasionally. It is powered by a 9v battery, or there is an AC adapter as a separate item. It’s a fun little practice amp, but it does actually work and has a powerful sound. It can give you what you need if that is just a little bit of sound to practice with. Or, you could just look at it. It is Marshall after all. Has the name and the look. Produces a good sound for such a small amp. Is going to be too small for some. 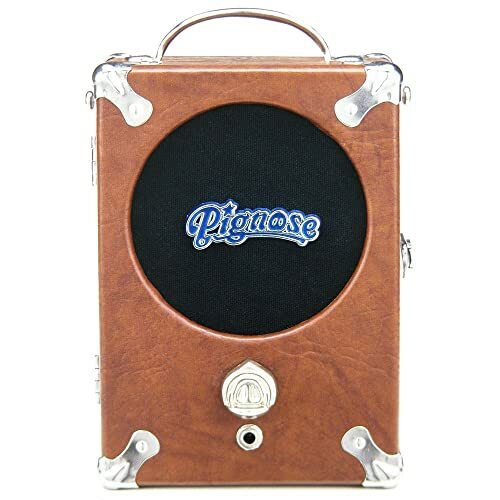 One of the earliest, if not the first, innovators of manufacturing quality small sized portable practice amps, Pignose have a reputation for quality gear. This amp is so highly thought of it has been around for 30 years and is still considered by some as one of the best. The 7-100 though is not just a practice amp, and its practical uses have been fully explored by a company who pride themselves on innovation. As a practice amp, it has a 5-inch speaker handling 5 watts of output. It is light on the kind of effects that many manufacturers are filling their amps with. The 7-100 is a practice amp, and that is what it is. One effect it does possess is that with a turn of the only control knob on the front you can go from a very clean sound to some heavyweight overdrive. 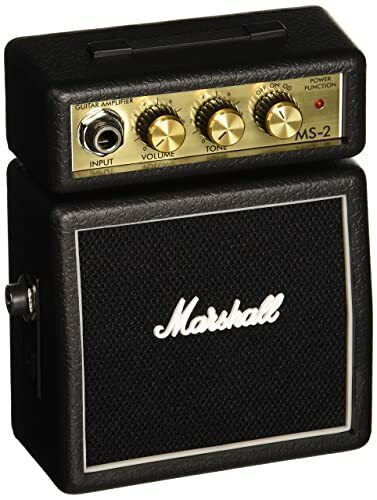 Some use this piece of kit to buy as a first amp, maybe for a son or daughter. It fits the bill perfectly. Just enough volume to sound real, with a good sound. Some even use it in a stage environment by sending the preamp signal to a larger amp. It is certainly built to last with its sturdy construction, robust covering and metal protectors on the corners. As a practice amp, it is very good. Powerful, not overloaded with too many sounds, and it is certainly worth some consideration. Very cheap pricing makes it an attractive option. It runs on 6 AA batteries or by AC adapter for power supply. Powerful little amp that has other potential uses. Some may want some effects onboard. If ever a piece of modern kit smacked of the 50s this must be it. We remember the first portable radios not looking, unlike this Danelectro practice amp. Aimed at the premium market, it boasts a number of features including a 2.5-inch speaker delivering the sound from the 1.5w amp. There is a 1/8th headphone socket that when in use bypasses the internal speaker. Basic sound controls include a volume, tone and some overdrive if you want it, the volume and overdrive deliver the goods, but the tone control is shall we say, a little lacking in options. It has a belt clip and a carry handle which makes it a little more portable, but I’m not sure they would get used that often. So, let’s get down to basics with this little amp. It does look a little like a toy amp, but when you turn it up, that opinion is shattered. It gets quite loud for the rating it is given. It is not sophisticated in any way. Designed with that retro feel, one could almost say its a bit of fun to have around, but that is not doing it justice. It is not going to compete with the expensive practice amps and was never meant to do so. What you’ve got here is a practice amp that will deliver a punchy sound for practice — nothing more, nothing less. Check the price, but sit down first. You will spend more in a restaurant for a decent meal than this will cost you. If you could find a better value for money amp for a bit of practice at home, we will be very surprised. It is powered by a 9v battery, Polaroid recommended, and the casing is made from plastic. Premium price makes it very attractive. Plastic will put some off. Some will want more features. Wouldn’t be music unless Fender were involved somewhere and here is their mini practice amp. 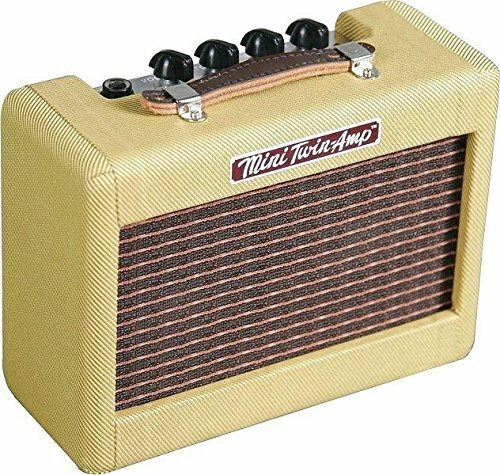 When the decision was made to produce and manufacture such an amp with the Fender name, we wonder if there wasn’t a meeting that said let’s make it look like a Fender Twin from the 50s. It looks like they have achieved just that. Even the tweed covering reminds us all of those heady days. It is small sounding though with just 1w of output and 2-inch speakers, which is not really going to raise the roof. It comes with a single channel and basic sound controls of volume, tone and a gain which will give you a little bit of distortion. It has a 1⁄4 inch jack socket for headphones which will also power an external speaker. As a practice amp, it is very basic, but it will do the job albeit quite quietly. But, if all you want is practice at a reasonable volume, this will suffice. Being of plastic construction, it is lightweight, small-sized and efficient and will do the job nicely. It operates from a 9v battery. When not in use it would make a nice piece of Fender nostalgia to have on view. Designed to look like a 50s Fender Twin. Some will want more volume from a practice amp. It has been an interesting journey, reviewing these amps to find the best portable practice amp. In doing so, we see some manufacturers designing little amps for practice but also giving us a shot of nostalgia — a nice idea. A great little amp with a few effects and well built. At the top end of the pricing scale but it is worth spending a bit on this. That is our choice as the best portable amp, though we might be tempted to add on a little nostalgia to keep in the living room, probably the Marshall, as well.